I bought the book Slow Burn by Fred Hahn because it was recommended in the book Itâ€™s Not Carpal Tunnel Syndrome I reviewed this August. The latter book tells about a hairdresser whose treatment for RSI wasn’t helping (yes: keyboards aren’t the only things bad for your hands). When she consulted with Fred, he told her she didn’t have the muscular strength required for her job, and simply doing her job wouldn’t give her that strength. Ballgame athletes also train in the gym in addition to training for their sports. After training with Fred for some time, the hairdresser was eventually able to carry on with her business. The Slow Burn book consists of two parts. The first eight chapters explain the benefits of strength training and weight training. The effects of various training methods and dietary habits are explained in clear language that is easy to understand, even for geeks who are more familiar with a computer’s innards than with their own. The second part has only two chapters. The first gives step by step methods to apply the slow burn method at home using dumb weights. The second does the same using the contraptions you find at the gym. While the cover and part one of the book talks about “30 minutes” a week, that’s actually a minimum. Part two of the book recommends every five days or even twice a week. I’ve also found that my actual sessions are closer to 40 or 45 minutes. I don’t rush myself going from one exercise to the next. The key point of the slow burn method is that instead of doing however many sets of however many repetitions, you choose a weight that you can comfortably yet barely lift. Moving the weight slowly, at a deliberate pace, you work your muscles to exhaustion in only half a dozen or so repetitions. This is why you can actually get results even if you only train 30 minutes a week. The disadvantage is that it’s no fun at all. To me it seems this method is perfect for people who have (far) more determination than time to train their bodies. I did the at home method for a couple of months. Though I did the routine twice a week, I didn’t make any significant progress. I didn’t really feel any different, even though the records I kept with repetitions and weights showed an increase. The exercises were uncomfortable. I felt I was spending more effort trying to keep my balance than actually training the muscle that was supposed to do the work for each exercise. Then in June a brand new gym opened close to our house. At only 5 to 10 minutes driving, depending on traffic, it could hardly be any closer. For the past five months I’ve been burning slowly three days a week. Since the membership cost is a fixed monthly fee, it seemed like a waste to go only once a week. Going every other day and one day off has been working just fine for me. The weight machines at the gym keep my balance for me. I just sit down. All the effort is taken by the muscles that each machine isolates. And I’ve been making real progress. No, I don’t look like Schwarzenegger, and I never will. Unless I’m wearing a body-hugging shirt, you likely won’t see any difference. I was never overweight, and I didn’t try to lose any. But I do feel much stronger and fitter. Somebody should have told me this ten years ago. Somebody probably did, but I didn’t listen. At least I didn’t wait until I couldn’t get up the stairs any more. (“Slow Burn” explains why that happens.) Three hours a week seems like such a small investment now. Though it cuts into my working schedule, I’m not less productive. My energy levels are higher and getting up early seems easier now. 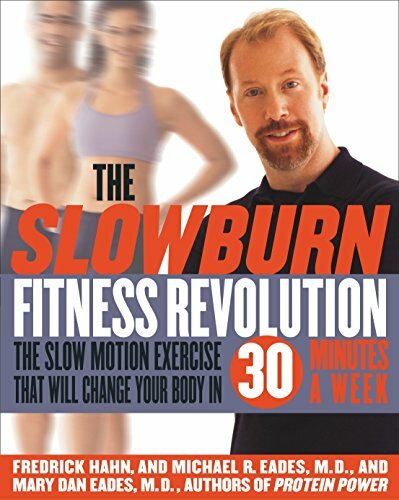 I’m not a personal trainer, so I can’t say if the slow burn method is good for you. There are other ways to train your body. Just don’t let your tombstone say “he was a real couch potato”. It’s Not Carpal Tunnel Syndrome by Suparna Damany and Jack Bellis is a must-read for anybody who spends more than a few hours a day. That’s probably everybody reading this geeky blog! 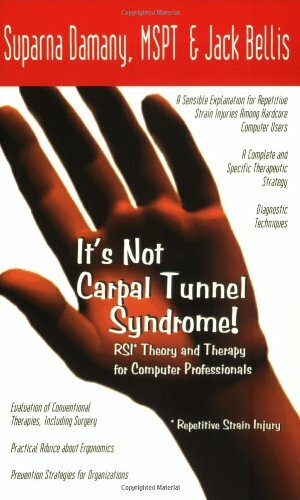 The title refers to the fact that Repetitive Stress Injury (RSI) is often misdiagnosed as Carpal Tunnel Syndrome (CTS). CTS occurs when a nerve that controls finger motion becomes trapped or restricted in its movement though your wrist. My 93-year-old grandmother who never touched a computer or typewriter in her whole life was treated for CTS over a decade ago. While it’s certainly possible for a PC junkie to suffer from CTS, it’s far more likely his wrist and nerve problems are a symptom of RSI rather than a direct problem in themselves. Whenever your fingers hit the keyboard or your arm reaches for the mouse, you’re applying a small amount of stress to your upper limbs. If you do that for long hours throughout the years, those repeated tiny bits of stress can wear you out, resulting in a case of RSI. This book explains the nerves and other body building blocks that suffer while you’re slaving away at the keyboard. The language used is very easy to read by any PC user. The few medical terms that are used are clearly explained. The second half of the book explains what you can do to prevent and/or cure RSI. You won’t find any miracle potions or step by step guides with guaranteed results. Instead, based on the knowledge of how people get RSI in the first place, you’ll find plenty of tips and suggestions of changes you can make to your working habits and equipment, and how those will affect your body. Since everybody’s different, what works for one person doesn’t necessarily work for somebody else. That’s what makes this book so useful: by learning about the innards of your upper limbs, you can make more educated choices, and ask more detailed questions when you seek medical advice. The best time to read this book is when you don’t have any RSI symptoms yet. It’s your best bet of never getting any. Seth Godin posted a list of the 24 best Seth Godin posts of 2004. Definitely an interesting read. If you want to read only one post, my favorite is Time to Take Action. Very inspiring. The right time to start or grow your shareware business is now! Focus, by Al Ries, and Positioning, by Al Ries and Jack Trout are two excellent books that provide a lot of good arguments against overextending your brands and your business. Reading these book will provide you with lots of food for thought, even if you don’t agree with all the arguments. There are obviously limits to how focused your business can be, or how well-defined your brands can be. Selling multiple software products can be quite a bit more profitable than sticking to just one. These two books will give you many good tips to extend your business without destroying your brands or losing your focus. Often, this will mean you will need to create new brands for new products, and that new products will have to be compatible with and complimentary to old ones. Only then will you be able to successfully sell more to existing customers. And that is where the soft drink companies failed: most people drink only one kind of cola. If a new cola flavor is successful, it is far more likely to cannibalize the company’s other flavors than those of the competition. Not to mention expanding the market of cola drinkers. Many businesspeople and “MBA-types” would rather fail with the rest of them, rather than try something different and be caught in a tight spot all alone. I’ll leave it up to you how you want to run your business and your life.